For another one of my Wordless Wednesday photos, see my other blog. For other people's, see wordlesswednesday.com. I was taking a walk in a local park when I heard a gnawing noise. It was this guy (girl?). 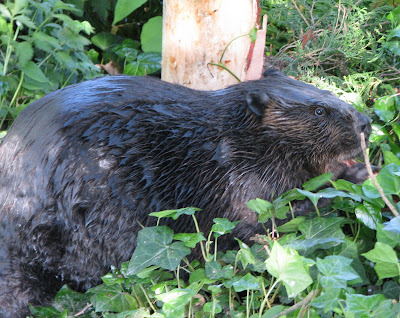 I'd never met a beaver in person before, even though they're Canada's national animal. A man on the trail told me that you can tell where they've been by the damage to the trees (this one had stripped the bark off the bottom of this tree). It's amazing to think that millions of people live in this area, yet it's entirely possible to encounter wildlife here: black bears (we've had them rolling around on our lawn and looking at us through the windows), coyotes, deer, raccoons, skunks, and now a beaver. Why how lucky to have a chance encounter a beaver. I have seen their handiwork, but never one out of their lodge or water. Endearing little critters aren't they. Great photo! I've never seen a beaver in the wild. What kind of an animal is that? Sure doesn't look friendly or cute and cudley!! Think I'd be running the other way. Have a good day, swing by for a vist.